Designed as a viewing café with the spectacular panorama of Bali, Jendela Bali Restaurant and Café is the most suitable place to end the day where visitors can enjoy the sunset and put the climax of their visit to GWK Cultural Park. 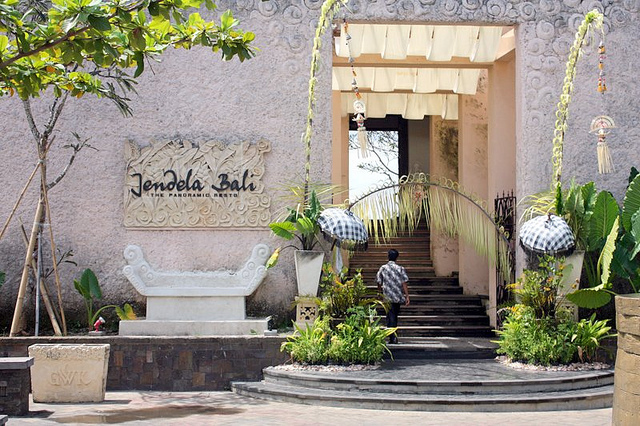 Jendela Bali The Panoramic Restaurant is located on top of a hill overlooking Bali coastline on the north. You can view the magnificent panorama while enjoying our chef’s special cuisine. You can admire the vast open sky at daytime and the beautiful citylight at night. All will add up to your complete and unforgetable dining experience. We have prepared special daily performances to accompany your dining experience. We’ve got a complete array of Balinese traditional art & cultural performances such as the beautiful rindik musical instrument and assorted Balinese dances. Get the complete sensation everyday, night and day (please check the schedule). Our chef has prepared a special set of menu of our best cuisine. Whether it’s for lunch or dinner, with your loved ones or on a large group, on a private event or on a corporate gathering, we will cater all your needs. Come and enjoy our special menu as well as our traditional healthy drinks. Your journey won’t be complete without tasting the authentic and delicious Balinese cuisine. You may also want to try the other specialty menu from Jendela Bali Restaurant.